The self-directed IRA custodian’s Facebook contest will award one winner two admissions to the 2013 Equity University Networking Conference, a hotel stay at the conference location and two Making Connections Networking Packages. Equity Trust Company is making it easier for one of its Facebook fans to make potentially profitable connections at its annual education and networking event. The self-directed IRA custodian invites Facebook users to visit its special 2013 Making Connections contest page to register to win two admissions to the 2013 Equity University Networking Conference, September 19-23, 2013 in Orlando, plus a hotel stay at the conference location and two Making Connections Networking Packages. 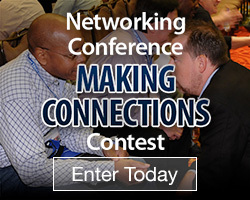 The total value of the prize is over $1,500, but the connections that attendees can make at the Networking Conference are priceless. More than 500 attendees are expected at the event, which features more than 40 education sessions for investors of all experience levels. The sessions, led by top industry experts and successful clients, focus on profit-generating strategies investors can use to grow their IRAs. The event will also feature ample opportunities for attendees to meet and compare wealth-building strategies directly. In addition to the popular Speed Networking sessions (included in admission price), guests will be able to take advantage of the Making Connections Networking Package upgrade, which includes breakfast and lunch September 20-22, as well as structured networking sessions. Making Connections Contest participants do need to be existing clients to enter. Entries will be accepted on the Facebook page until noon on July 12, 2013. Those who want to enter or read the official rules can visit the Equity Trust Making Connections Contest Facebook page. For more details on the Equity University Networking Conference, visit http://www.equity-university.com/NetCon.